Portable and affordable Focus 40 and Focus 80 Braille Displays with the latest in braille display technology put you in control as you smoothly navigate the Windows� environment. Based on features rated most desirable by braille display users, Focus Braille Displays are packed with advanced features and options that can be easily configured through JAWS�. The new design eliminates seams between the braille cells, making the display feel like paper! The convenient location of navigation keys, bars and buttons promotes comfort and more economical hand movement. Choose the 40-cell Focus 40 or the 80-cell Focus 80, depending on your workstation requirements. 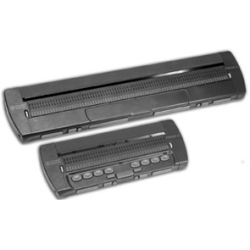 Both models include easy-to-remember braille commands for Windows, JAWS for Windows, and braille settings.Used with the JAWS screen reader, the refreshable braille cells act as a tactile monitor that allows you to navigate and read information in dynamic braille. Sleek, portable, and very customizable, Focus Braille Displays provide unparalleled accuracy, navigation, and comfort.